Not content with laying out a full-blown augmented reality (AR) platform with its new smartphone camera software, Facebook has launched two, brand new 360-degree video cameras to jump start that end of the immersive social media revolution. 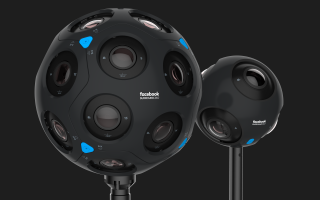 During Facebook’s second and last keynote address at its F8 developer conference in San Jose, California, Facebook CTO Mike Schroepfer debuted the new hardware dubbed Surround 360 x24 and x6. Looking a lot like Nokia’s own OZO 360-degree camera, the two sequels sport 24 and six lenses, respectively, in a spherical orientation. Clearly, this is a marked upgrade upon the previous Facebook Surround 360 camera, which simply had a circular band of cameras. Both cameras are said to capture the full RGB color spectrum and use new depth-estimation algorithms through image oversampling – four times and three times oversampling on the x24 and x6, respectively – to produce better image quality. These improved depth-sensing techniques are said to also afford content creators more impressive 360-degree pieces of video. For instance, live-action video shot with these cameras is supported in existing visual effect editing tools. Because everything in a scene captured by these cameras includes depth information, computer-generated imagery, or CGI, elements can be integrated into live action sequences captured by these cameras. These cameras are clearly designed for content creators, but tease a future in which 360-degree video gets even better, with readier access to 3D effects and allowing for viewers to move around within said video – rather than be the focal point of the camera(s). Designed and prototyped in Facebook’s own Area 404 lab with help from FLIR, a specialized computer imaging company, the social network aims to license out its designs to manufacturing partners to kick start its adoption by content creators. Better yet, Facebook also revealed that it has boosted the effective resolution of 360-degree video on its platform when streaming to non-VR and VR devices by 51% and 59%, respectively, by using machine learning techniques. These AI techniques predict where viewers will focus on most within a video or be most interested in, devoting the majority of rendered pixels to those areas and at the right times, thus increasing effective resolution. What this all means for you, in the long run, is 360-degree video somehow cooler than it already is – stay tuned to those News Feeds.